A wine cellar refrigeration system is designed exclusively to help create and maintain a stable and consistent wine cellar environment. Temperature plays an important role in the maturation process of wines, while the correct humidity level keeps the cork moist and expanded, and thus maintaining its sealing quality. For optimum wine storage conditions, the temperature must be kept within 50°F and 55°F, with the relative humidity between 60% and 75%. On the market are three primary categories of wine cellar refrigeration systems: self-contained cooling systems, ductless-split refrigeration units, and ducted-split climate control systems. These units are available in a range of sizes, configurations, and cooling capacities, that can address the unique specifications and needs of commercial and residential wine cellars. For optimum cooling performance and efficient operation, a ductless-split refrigeration unit is the best cooling option. 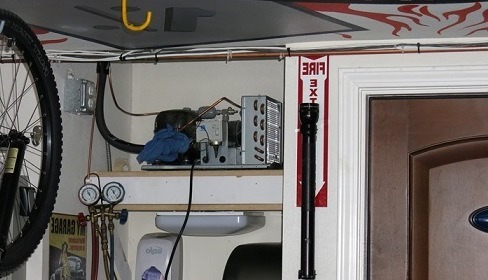 This climate control system uses a line set to connect two separate units; the evaporator unit is installed inside the room and the condensing unit outside. Separating both components allows the noise-producing condenser to be located remotely, thus reducing the production of noise and vibration inside a wine storage space. 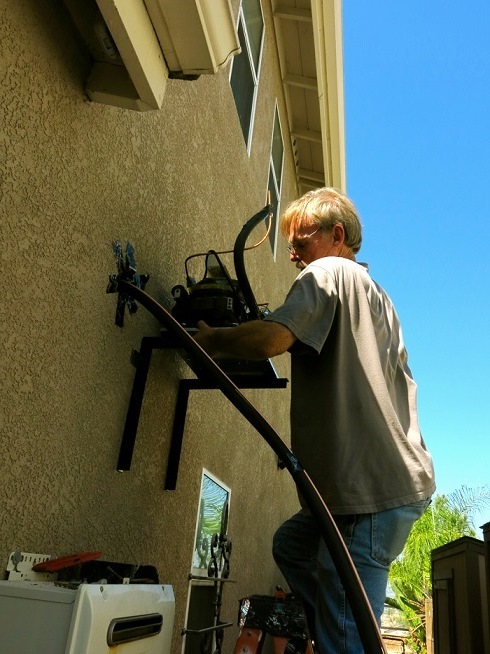 Although the condensing unit can be located indoors (such as the attic or garage space), wine cellar cooling installation specialists recommend locating the unit outdoors, where it can receive proper ventilation. 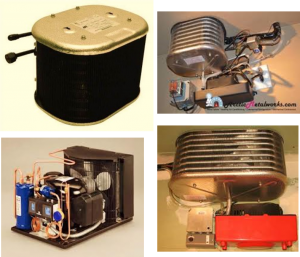 Since these indoor spaces have a tendency to gather heat throughout the summer months, placing the condensing unit in one of these areas can lead to a compressor failure and bring serious consequences to expensive wine collections. This recently finished wine cellar cooling installation Aliso Viejo CA project demonstrates the importance of providing a well-ventilated space for condensers. The project involved replacing an existing condensing unit that was damaged due to exposure to extremely high temperature levels. The condensing part of the residential wine cellar cooling system was originally located in the garage, which had a temperature reaching up to 100 degrees in the summer. The heat emanating from the garage space reduced the chilling capacity of the condensing unit, causing a warm wine storage environment in the process. Upon initial inspection by Arctic Metalworks, the refrigeration component was discovered to be overheating. To keep the condenser perpetually cool, the Arctic team suggested moving the unit to the side yard. The Arctic wine cellar cooling installation Aliso Viejo CA team fabricated angle brackets to hold the residential wine cellar cooling system in place. 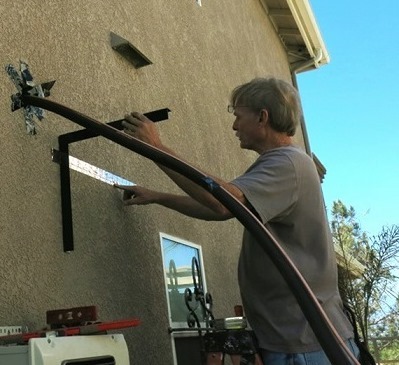 After anchoring the angle mounts to the walk, the condensing unit was removed from the carport and secured to the brackets in the yard. Two additional copper tubes were attached to the existing line set, which is located in the garage space. After completing all copper and electrical wiring connections, the Arctic wine cellar cooling installation team attached a rain shield to the residential wine cellar cooling unit to protect the compressor against elements, and recharged the system with R134a refrigerant. Starting and testing the system allowed the Arctic team to detect a compressor malfunction. The existing condenser had to be replaced with a new one; it failed due to the high heat in the garage space. The Arctic wine cellar cooling installation team came back a few days later to replace the outside half of the split refrigeration unit with a brand new 1/3 hp Arctic 0033 split system. The wine room climate control system is now in perfect working condition, and the client is very happy with the result of the wine cellar cooling installation Aliso Viejo CA project. When building commercial and residential wine cellars, it is important to integrate the proper support infrastructure (such as insulation, vapor barriers, and an exterior grade entryway door) into the wine cellar design, to ensure that the wine cellar environment remains stable and tightly sealed. A carefully constructed wine enclave will not only create the best climate conditions for storing and aging wines, but also allow wine cellar refrigeration systems to provide optimum cooling performance. Arctic Metalworks specializes in wine cellar refrigeration systems, for both commercial and residential wine cellars. This family owned and operated business is committed to manufacturing and supplying top quality wine cellar climate control systems, backed by a team of refrigeration specialists dedicated to providing exceptional service and professionalism. Their wine cellar cooling products are manufactured from commercial grade materials, and are designed to fit the unique needs and specifications of a custom wine cellar. This Southern California-based company expanded their business to include wine cellar construction and renovation, as well as custom wine rack making.